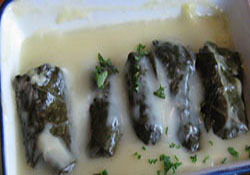 Made of meat and rice wrapped in grape leaves with a Avgolemono (egg-lemon) sauce. Dolmathes is a Greek recipe taught to me by my mother-in-law. When served as hors d'oeuvres they are made quite small and are called dolmathakia (little dolmathes). Greek cooking is fun and exciting. Rinse grape leaves in cold water three times to remove brine preservative. Drop into a pan of boiling hot water and soak for 1 hour to soften. Combine beef and lamb and blend in thoroughly all the rest of the ingredients except the butter,tomato paste and water. Mix a cup of warm water with tomato sauce and pour over grape leaf rolls. Add more water if needed to just cover the dolmathes. To keep them in place put a heavy plate over them inside the kettle. Cover and simmer for about 1 hour. Remove from heat and take out the plate that was used as a weight. To make the sauce: Beat egg whites in a mixing bowl till they are stiff. whisk egg yolks slightly, then add slowly to the stiff whites while continually beating. Add about 2 Tbl of lemon juice. Slowly add this to the eggs, continue beating. Gradually add small amount of hot broth from the pot to egg-lemon mixture while constantly mixing to avoid curdling and to retain thick foamy appearance. Pour this sauce over dolmathes with remaining broth. Rotate and tip pot to ensure all are covered with sauce. Let sit a few minutes, then transfer to a serving platter and serve immediately. Suggestions: If rewarming the next day, it must be warmed very slowly, however the sauce will not have the same thick and foamy appearance as it did fresh. If you do not care for grape leaves or can't find them, try substituting the grape leaf with lettuce leaves. Lettuce is not as strong and will break up easier while cooking if not packed tightly and weighted down. You may want to make the lettuce limp before trying to roll in the meat.